Okay, let me rephrase it a bit, I love Conn Iggulden and his ability to create a story where you are immersed into it. I couldn’t pick a side, every character felt real and I understood what they were doing. I still can’t pick a side. It was good to see Margaret grow to be a strong woman, especially when her husband is unable to not only lead the country, but also take care of himself. It’s strange to think these characters existed and the events that unfolded. 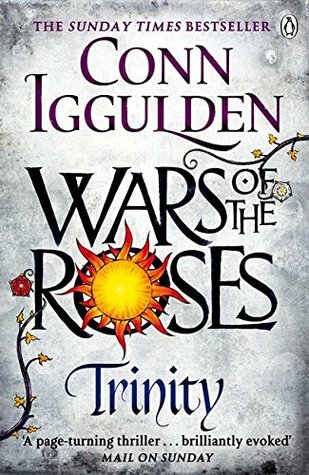 Trinity is a book full of the early battles of War of the Roses. I know I’m going to say this a lot, but Conn Iggulden put you right into the battle. You’re on the edge of your seat, biting your nails, waiting to see who will live and who will die. Please, if you haven’t read this series yet, or read anything by Conn Iggulden, do it. You won’t regret it. Even though I can’t wait to start book three then four, I don’t want this to series to finish. Maybe Conn might write about the Tudor dynasty?